H. Paul Honsinger is a retired attorney. Born and raised in Lake Charles, Louisiana, he is a graduate of Lake Charles High School, The University of Michigan in Ann Arbor, and Louisiana State University Law School in Baton Rouge. Honsinger currently lives in Lake Havasu City, Arizona with his beloved wife, Kathleen, and his daughter and stepson, as well as a 185-pound English Mastiff and two highly eccentric cats. Paul’s hobbies include astronomy, military history, and the history of the Apollo Program. CLICK HERE FOR MORE NOVELS BY H. PAUL HONSINGER. The term “military science fiction” has, at times, been misused. The military part of the science fiction gets lost, and in essence you have something that loosely approximates combat in the future. To Honor You Call Us, book one of H. Paul Honsinger’s MAN OF WAR series, is not cut from that cloth and it was almost shockingly good. 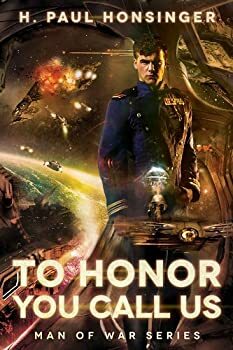 Max Robichaux is a young Union Space Navy Lieutenant with a history. He’s made mistakes in the past, both in terms of his military career and some extracurricular activities. The great thing about Max is that he is not afraid to fight and take chances. The bad thing about Max is that he is willing to take chances.